Fortunately, when I waltzed into one of our high-end kitchen boutiques on a whim, ready to make the commitment, they didn’t have the size and color I wanted in stock–and it was a few days before “pay day” anyway–so my impulse buying was derailed. Fortunately. By vowing to come back after “pay day” to place an order, I inadvertently saved myself about $250! One of my close foodie friends who works part-time at the shop saw me on my way out, inquired about what I was shopping for, and when I told her, she quietly asked, “Have you looked around?” That planted the seed for the prudence of doing a bit of online research, which I actually enjoy doing unless it gets to protracted and baffling, say, when researching something technological, like a camera. When faced with a technical culinary question, I typically turn first to two sources: the Food Network’s mad kitchen scientist Alton Brown for cooking questions, and Cook’s Illustrated/Cook’s Country for both cooking and product-related questions. The latter highly recommended the Tramontina 6-quart enameled cast iron Dutch oven available, believe it or not, at Wal-Mart among other places. It currently retails for $59.97 there and a bit higher elsewhere. So, at a sixth of the price, I thought, “Why not?” as I rarely second-guess Cook’s Illustrated. But I wasn’t wild about the limited color selection, so I decided to read some reviews which, despite the Cook’s endorsement, weren’t glowing. One of the biggest complaints seemed to be an ill-fitting lid which is problematic when the point is to contain moisture. And I began to have second thoughts. The gold standard for enameled cast iron Dutch ovens is unquestionably Le Creuset, but I wasn’t sure I needed an “heirloom” pot. I certainly wanted excellent quality, but I also wanted a good value. So then I heard about a highly touted Costco brand called the Kirkland. It’s 6-quart model sells for in the neighborhood of $50 as well. But, again, the colors were limited, though the reviews I read were a bit more convincing. The only negative I recall was that one reviewer said the lid was made with 3 raised points so that it would sit flat like a three-legged stool on the pot rim without the extra expense/labor of planing it to fit flush. Hence, some steam escaped. But either that reviewer or another one said he had heard that Lodge had started planing their lids for a perfect fit so that escaping steam is no longer an issue. Plus, the pots have an anti-chip coating, a fairly common issue with Dutch ovens. Convinced, I decided to take the plunge, ordered it, and it arrived this week with a perfectly fitting lid, no chips, and in a glorious pumpkin tone. It is so handsome and a perfect weight. Everything feels exactly right about it from the lid knob, to the handles, to the way my bamboo spoon glides across the interior surface. I was happy to rearrange a cabinet so that it had it’s very own, easily accessible storage spot. It’s maiden voyage was a vegan tagine I made yesterday for a dinner with two gal pals last night (Joe is out of town–home today! ), and I couldn’t be more thrilled. I will post that recipe soon, as it is definitely a keeper! The pot cooked it beautifully, creating lots of moisture and allowing yummy caramelized browned bits to form but not stick on the bottom. And it cleaned up in a breeze. If, like me, you’ve been contemplating such a purchase, but have yet to commit. 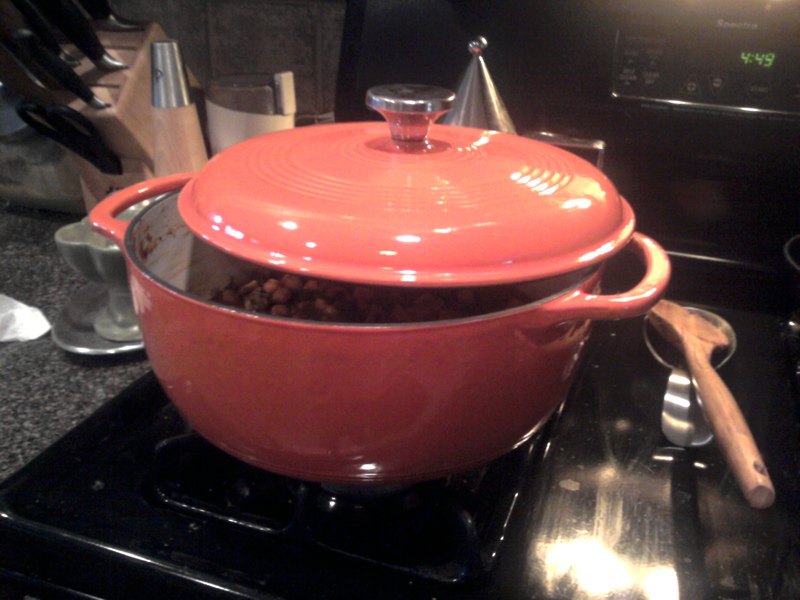 I highly recommend the enameled cast iron Dutch oven from Lodge, a trusted, long-established, American company.